Your wedding day is the most important day of your life and you want to remember it forever. The best way to do this is to have an official wedding photographer there to capture all of the important moments. But with so many wedding photographers out there, how do you know which one is perfect for you? The best way to start is to get on the internet and look for wedding photographers in your area. Have a look at their websites, especially the portfolio pages to see photographs from weddings that they have previously attended. From there you’ll be able to gauge if you like their style of photography, and whether or not you want to meet with them. Many wedding photographers go to wedding fayres to exhibit which can also be a good place to start. You might find that photographers give out discounts, special rates or freebie “add-ons” to people who book with them after meeting them at a wedding fayre. Take a look at these two different styles of shots. One of them is very traditional and one of them is known as ‘reportage’. Traditional photographs tend to be “staged”, with people told to stand or sit in a certain way and smile for the camera. Reportage wedding photography is more natural, with shots taken of people when they aren’t even aware the photographer is watching them. This allows more emotion to be captured, as well as the special moments that may otherwise have been lost, such as a bride’s hug with her father before walking down the aisle, or the laughter on your guest’s faces during the best man’s speech. What is the wedding photographer like as a person? 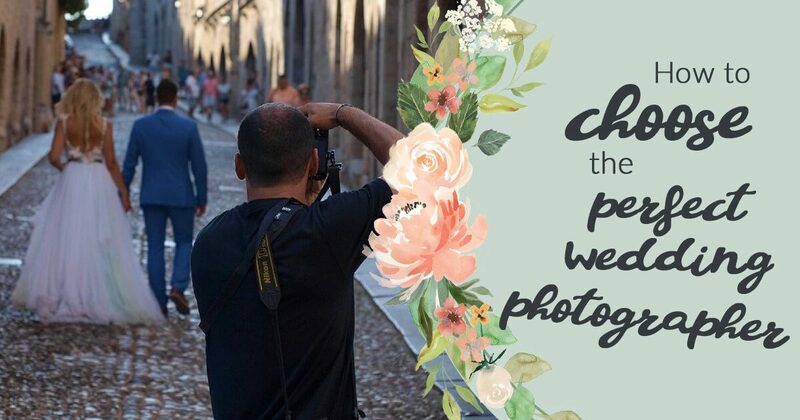 This is the all important factor in deciding who you are going to trust to capture your wedding day: is the photographer friendly? At your first meeting you should be able to tell straight away whether this is someone who is going to work tirelessly on the day to make sure that you get the photos that you want, or someone who is just there “to do the job”. Also (and I am being a bit stereotypical here), photographers tend to have a bit of a reputation for being slightly grumpy buggers. Why? It’s because at weddings they tend to be rushed off of their feet and are often treated with contempt or frustration by guests who “don’t like having their picture taken” or don’t want to interrupt their conversation to “smile for the camera”. What you’re looking for is someone who is going to make you and your guests feel comfortable on the day. You need someone personable who is able to make people laugh, smile and shine for the camera. Wedding photographers are usually upfront about their costs. Prices can range from £600 to over £3000. Comparing the different packages available from different photographers should give you an idea as to whether you’re getting the best deal and whether or not you’re going to get the service and the shots that you really want. Have a look at different photographers and see what services and packages they offer. What makes them different from the competition and do their prices seem fair? It is all down to personal preference, but the most expensive isn’t always the best, and the cheapest isn’t always the worst. That being said, you do get what you pay for with photography. Price shouldn’t be the end of the world – it’s not worth getting the cheapest photographer you can find (who is probably the least experienced) as you may end up being disappointed with poor quality photographs for the rest of your lives. Are they passionate about their equipment? Most wedding photographers live and breathe photography. They’re constantly on the lookout for equipment and tools that will improve their shots and their workflow. 99% of clients don’t really care about what kind of camera and lenses a photographer is using. However, asking the question “what equipment do you use?” is a great way of gauging a photographer’s passion for their craft. If they spout on about their camera make/model, lenses and lighting with all the tenderness that they might use when describing their first-born child, well, you’re probably on to a winner. If you’re interested, many photographers will provide you with a kit list but this isn’t essential. You wouldn’t ask about the tools your plumber would use. You just expect them to know how it works and that they can do their job. Before you book a wedding photographer, have a chat with someone who has used them for their own wedding. This can be a message on Facebook, an email conversation or a chat on the phone. Ask the photographer for contact details of a couple of previous clients that they are happy for you to contact. If they refuse, that may mean that they have something to hide. Another way to determine the feelings of past clients is to look on social media to find out what people are saying about the photographer. If they have a Facebook page, there’s normally a rating system in place so you can see the good and the bad things that previous clients have said. We got a personal recommendation from someone we knew and trusted and had a face-to-face meeting with them before we booked to make sure we were happy. If you don’t trust your photographer at the first meeting, or if you have doubts about their abilities, style or services that they provide, go back to the drawing board. Your wedding photos will stay with you forever – choosing the right wedding photographer is a decision for life; don’t rush it.